Asalpha’s makeover attempts to turn the slum into Mumbai’s Positano. But this is art at its weakest, art that refuses to engage, art that forgets to raise questions. The colourful slum, if anything, is a gentle reminder of our disregard. ince December last year, a new project in Mumbai has caused mild ripples online. As is the case with any urban beautification drive, the Chal Rang De team’s initiative to prettify the supposedly unattractive walls of Siddhivinayak slum in Asalpha, a neighbourhood in the Mumbai suburb Ghatkopar, has been followed with breathless – and unquestioning – excitement. The team has managed to change the area’s look by painting the walls of the squatter establishment. Viewed from the passing Metro train, it looks like a massive, vibrant Piet Mondrian canvas. But here’s the thing. A slum is not an art gallery. But according to Dedeepya Reddy, the initiative’s founder, the Siddhivinayak slum, located on a hill, could be Mumbai’s future Positano. There are several problems with this baffling Hill Slum=Positano approach. The most obvious is that the only thing common between them is their sprawl up a slope. It’s like saying Mahabaleshwar is a lot like Monte Carlo because they are both pleasant during the summer. Giving the slum this aesthetic makeover is the literal definition of papering over its socio-economic conditions. It’s unlikely that Siddhivinayak will transform into a luxurious Italian destination in this lifetime, but I suppose one can be hopeful. The Siddhivinayak slum has been around since the 1990s. Its grim reality is no different from that of Mumbai’s other slums. In this arrangement of alternating passages and lines of kholis, water run-off from washed vessels and clothes pools and stagnates in the middle of the lane; the insides of some of the kholis are pitch dark even during the day. Life here is tough as nails. But with a fresh coat of bright paint, this grim reality of 13 million Mumbaikars is now a pretty sight for Metro commuters. So, yay! Thanks to a growing interest in India, this romanticisation of slum life, that began with Slumdog Millionaire in 2008, is now a tourist attraction in the form of Dharavi Walks. What started as a chance for the rest of the city to try and understand slum-dwellers, previously only viewed as dirt-poor criminals, swiftly turned into “poverty tourism”. Yet, it was at least able to generate revenue for the people of Dharavi, by offering them a chance to show visitors around. But it is one thing to romanticise street life, and quite another to camouflage it in pretty colours and pretend that reality is all meadows and flowing brooks. Money is still hard to come by, safety is still an issue, hygiene is still non-existent, and higher education is a void. It is akin to telling someone wearing tattered clothes to doll up and play pretty just because you find it extremely awkward to look at rags amid riches. The Chal Rang De project isn’t the first in the world to have lost focus in the process. 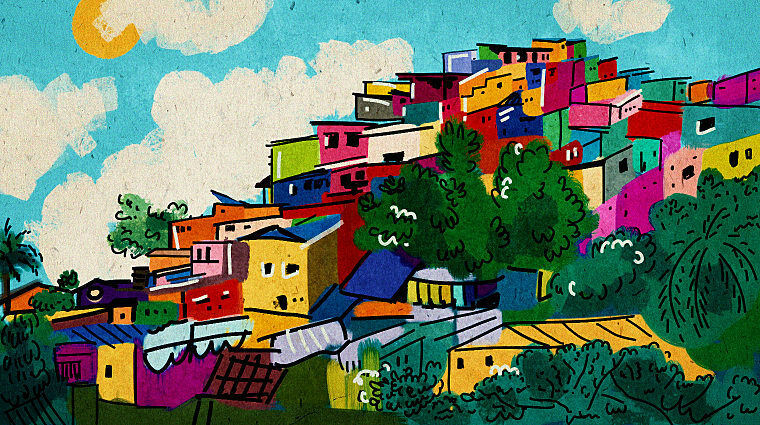 After a similar project with a similar intent of community transformation, artists Haas&Hahn beautifully explained in a TED talk, the plan they followed to paint Rio de Janeiro’s favelas (another word for a slum). They never talked about the social impact because there wasn’t any. Viewed from the passing Metro train, the beautification of Asalpha looks like a massive, vibrant Piet Mondrian canvas. I did find an exotic example that at least tried. eL Seed, a French artist, created a massive “calligraffiti” mural over buildings in a poverty-stricken part of Cairo for “not beautifying a place by bringing art to it but to open a dialogue.” At the very least, the artist did not ignore the socially visible and vulnerable position of the slums he was working in. The coloured walls of Siddhivinayak slum are a soothing sight for sore eyes, diverting attention away from the cringeworthy part of the city. That art could have been used to achieve loftier objectives. Art could ask tough but important questions such as “Why does our rural population migrate to cities?”, or “When will the flaws in housing and employment urban policy change?” Secondary objectives of making the slum self-sustainable with tourism would then have a wider, deeper scope. Siddhivinayak’s makeover is inoffensive, and therein lies the rub. It is pretty but purposeless. Its impact is so insignificant that we will view it, smile, and move on. This is art at its weakest, art that refuses to engage, art that forgets to raise questions. The colourful Asalpha slum, if anything, is a gentle reminder of our disregard. As we breathlessly forward videos of the slum’s transformation, do we pause to think of its residents? As spectators of the specimen, do we ask for any explanations? An attractive view is what we get in exchange for passivity. Of course, it might be unfair to put the burden of these questions on art. The Bollywood Art Project, for instance, only focuses on reviving and preserving bits of a massive industry that has been a part of our cultural identity. But as far as Asalpha is concerned, the large-scale project could have stirred public discussion about urban poverty and investigate the class divide. Instead, what we are left with, is a missed opportunity. Sayli Godbole just can't let things be as they are, but most results of her nitpicking are not too bad. She does not tweet as @GodboleSayli, but you can tweet to her.